This Rosé wine has a very beautiful rose colour and an expressive taste of cherries, red berries, and plums, combined with tasty sweetness, smooth acidity and rather low alcohol. 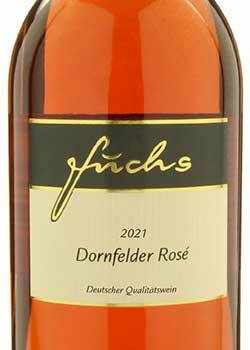 Dornfelder rosé wine is a delicious wine for enjoyment - well-cooled - for all gourmands having a sweet tooth. Scrumptious with sweet desserts. Enjoy it well cooled – it is a terrific drink for warm summer nights.